Review | Every day the same is easy and predictable. But perhaps there is room for improvement, because there is more than the usual German bratwurst, French croissants and Japanese sushi? Up to now, in the motoring industry Korean meant cheaper yet certainly not better. Kia wants to change this by introducing the all-new Cee'd. According to the car maker it will even seduce the most stubborn creature of habit. It all started in 1999 with the "Shuma". This wasn't a bad car to drive and the low price certainly made it attractive. At the same time is was painfully easy to see why the Shuma was so cheap. Build quality was poor and its looks were cumbersome. Kia learned from its mistakes and introduced the first "Cee'd" in 2007. This time there was nothing wrong with the quality and design was fair. Rightfully so, the first Cee'd meant the final breakthrough for Kia on the European market. For this second generation of the Cee'd Kia wants even more. Kia doesn't merely want to be an economic alternative, but more a first choice. When it comes to visual design, the Cee'd 2012 offers everything it needs to realise its ambitions. The new Cee'd has been designed in Europe and will only be sold in Europe. This is why the designers did not have to compromise on looks to appeal to different markets. Also: the new Cee'd has the charisma the Koreans have lacked up to now. Under the skin the Cee'd is equal to the new Hyundai i30. While the Hyundai is extravagant and obvious, the Kia has a more refined charm. "When the basic proportions are right, there's no need to bother too much with the details", said Peter Schreyer (former designer for Audi). Once inside, the Cee'd oozes beauty and quality. The design is less sterile than that of a German car and shows more originality than a Japanese car. The materials used and the build quality are excellent. The cabin space is average for a car of this size. Just like the name implies, the "Cee'd" exceeds expectations time and time again. For example, the climate control doesn't just feature two zones, but can also do its job quickly (but audibly) or softly (and quietly). Every Cee'd comes with an input for an mp3 player or smartphone. Again Kia offers more than just the basics and supplies a USB connector, an AUX input and Bluetooth connectivity. The headlights simply turn themselves off when the engine is stopped, that makes more sense than sounding a reminder. The speedometer deserves a special mention because it has been replaced by a large display. On the outer rim a traditional speedometer is shown, which looks so real that many would not even realize this is a projection. In the centre of the display, information from the satnav and trip computer is shown. The only other cars that offer a similar feature cost four times as much as the Cee'd! With a push of a button the driver can select comfortable, normal or sporty steering. The difference between these modes is noticeable. In city traffic the light "comfort" steering is pleasant, especially while parking. On twisty roads the sporty steering is preferable, because the driver has more feeling with the car. As a bonus, the heavier steering makes it easier to go straight on the open road. As stated before, the all-new Cee'd has been developed especially for the European market. This is why the suspension is exactly like the European driver wants it to be. On bad surfaces the Cee'd offers sufficient comfort, while the car hardly tilts in the corners. However, the Cee'd isn't an exciting car to drive. When driving fast the Cee'd doesn't disappoint, but it never comes alive. 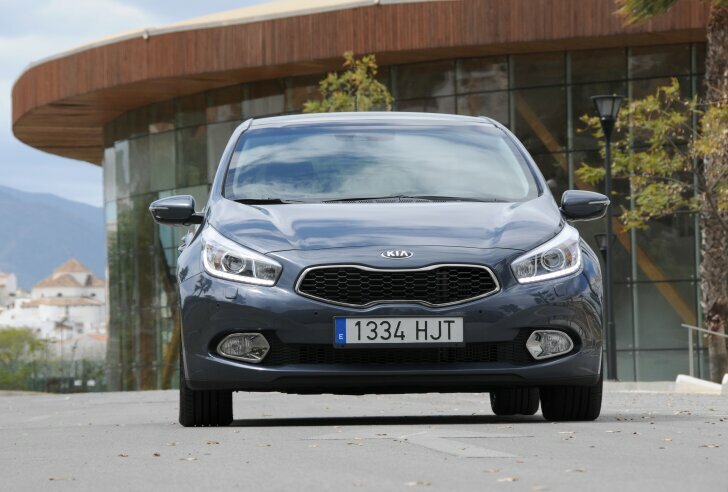 While the Cee'd can compete with its European rivals in many ways, Kia forgot about downsizing. Many other brands fit their mid-sized family cars with tiny engines that perform well, while offering superior fuel economy. 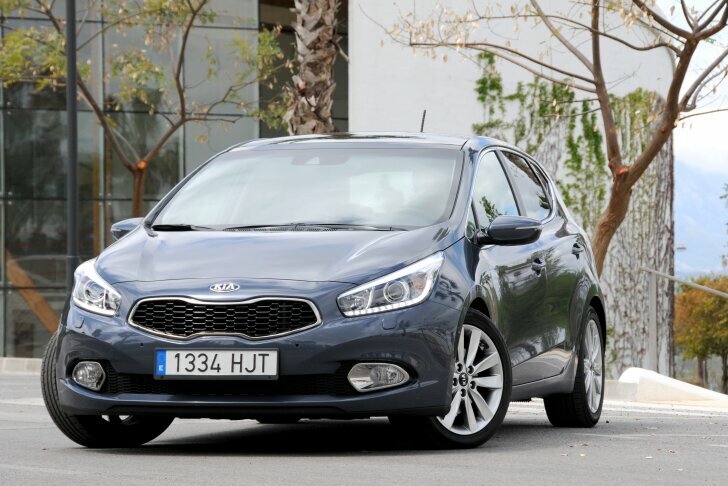 Kia offers no such thing and offers the Cee'd with basic 1.4 and 1.6 litre engines. A stop/start mechanism and eco tyres with low rolling resistance are available, but do not come as standard. The 1.6 litre diesel engine does its job the way it should, no more and no less. As can be expected from a modern car in this segment, the diesel engine is quiet and refined. No matter what engine speed, most of the 128 PS / 260 Nm is available most of the time. This means that no matter what gear is engaged, the Cee'd diesel never complains. One driver may experience this as comfortable, others regard it as lack of character. According to the book the "1.6 CRDi" does 76 miles to the gallon. On a highly demanding route, this wasn't archived by a long shot. The test car only covered 50 miles on a gallon of diesel. The 1.6 litre petrol engine is more convincing. This 135 PS / 164 Nm strong four-cylinder engine shows more character and is therefore more fun to drive. For a petrol engine, its maximum torque is available from a remarkably low engine speed. This is why the petrol engine can be driven as if it was a diesel! Despite another demanding test track (mountains, city traffic) the test car exactly matched Kia's figure of 6.1 litres per 100 km (46 mpg). The Cee'd can optionally be fitted with an automatic gearbox with two clutches. In fact it comprises of two gearboxes: one for the odd and one for the even gears. In that way, while accelerating the driver doesn't switch gears, but gearboxes. This takes less time, making the Cee'd with "DCT" gearbox quicker and more comfortable. As a general rule, a dual clutch gearbox improves fuel economy, but this isn't the case with the Cee'd. Kia's "DCT" gearbox also isn't as quick as Volkswagen's "DSG" box. Yet, the DCT gearbox isn't bad at all and does add to comfort and driving fun. Can Kia seduce even the worst creature of habit to the Korean kitchen? Yes, without a doubt! The seduction starts with good looks. The Cee'd doesn't only offer the same charisma as a European car, it also offers the same spaciousness and build quality. Roadholding is fine, yet not exceptional. 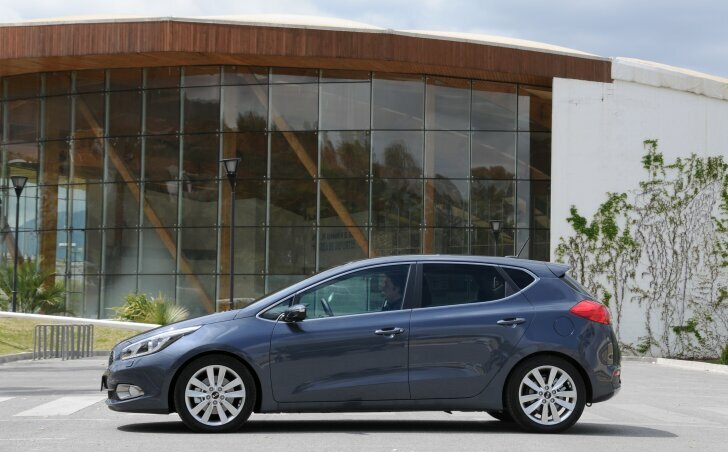 Although the Kia Cee'd and Hyundai i30 are technically identical, only the Kia offers an automatic gearbox with a double clutch. The latter makes the Cee'd more comfortable and more fun to drive. Just like before, the low price will do the rest. When just regarding size and performance, the Kia seems hardly cheaper than its rivals. Yet at the same price the Cee'd offers a higher trim level, offering more safety and comfort. Enjoy!